Summer time can do a number on your skin. I know that when I went on vacation this Summer I forgot my nice facial sunscreen (Elta MD) and ended up rubbing the kids’ waterproof stuff on my face all day at an amusement park. The result was super rough, bumpy skin that was not at all happy with me! Sunburns. Windy lake days. Salty beach waves. Chlorinated pool water. Dry, hot air. There are lots of Summer skin hazards. It may be time to revamp your skin care routine to add a little Summertime rescue. How do you repair the damage? You start with a good scrub. I mean a good exfoliating facial scrub that can remove rough, dry skin without causing damage. Then your skin is prepared to accept and absorb treatment products and moisturizers to begin repairing the Summer damage. You want to avoid facial scrubs that have ground fruit pits and nut shells. Those are much too harsh and although they will definitely remove layers of dead skin, they also end up creating micro tears in the skin that cause damage and can allow bacteria to grow. You want to exfoliate but you also want to protect your skin. It’s a fine line to walk! 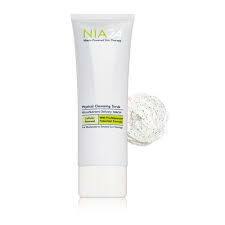 At NuVista Plastic Surgery our Favorite scrub is NIA 24. It contains micro beads covered in Jojoba oil so the skin is not torn or damaged. If you want lighter exfoliation, use it in the shower when your skin is thoroughly wet and there is lots of water to thin the scrub. I recommend twice a week in the shower for healthy skin maintenance and if you are new to using a physical exfoliant. If you need a deeper exfoliation– like I did after the sunscreen disaster!– then use the scrub at the bathroom sink. Wet your hands but not your face. Massage the scrub into every crevice of your face in a circular motion. You will feel a real difference compared to the shower regimen. Don’t be too harsh in your scrubbing. You don’t have to fix every problem with your first exfoliation. Your goal is not to trade Summer damage for red, sensitive, over scrubbed skin. Gently massage your face. Use your hands and water to rinse the scrub off. Now your face is prepped for treatment and moisture. The fresher, newer skin can allow other topical treatments to more deeply penetrate the skin. 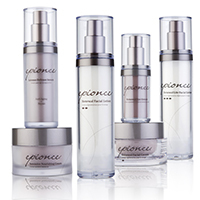 We recommend the Epionce duo of a treatment Lytic and a Renewal Moisturizer. The products are tailor made for your skin type—oily, dry, or somewhere in between. And what is amazing about this duo is that when used together, clinical testing proves that they are as effective on fine lines and skin turn over as using a retinol but without the harsh chemical side effects! That is a perfect recipe for skin already recovering from Summer mishaps. All the treatment with none of the irritation! Come in and we will help you put together the perfect product package to treat and protect your skin.